Valentino Rossi said he wasn’t surprised to see Casey Stoner dominating the opening day of practice for this weekend’s Australian Grand Prix at Phillip Island earlier today. Fears the slow recovering right ankle injury he suffered in Indianapolis might seriously hinder the Aussie in his final appearance at Phillip Island vanished today as Stoner delivered a stunning performance in front of a huge home crowd. He finished almost a second faster than the field in both practice sessions today with a best lap of 1.29.999 putting him 0.885s clear of Repsol Honda teammate Dani Pedrosa on the combined timesheets. Rossi was over two seconds behind the 27-year-old, though he wasn’t too disheartened considering world championship leader Jorge Lorenzo couldn’t get within a second of Stoner. 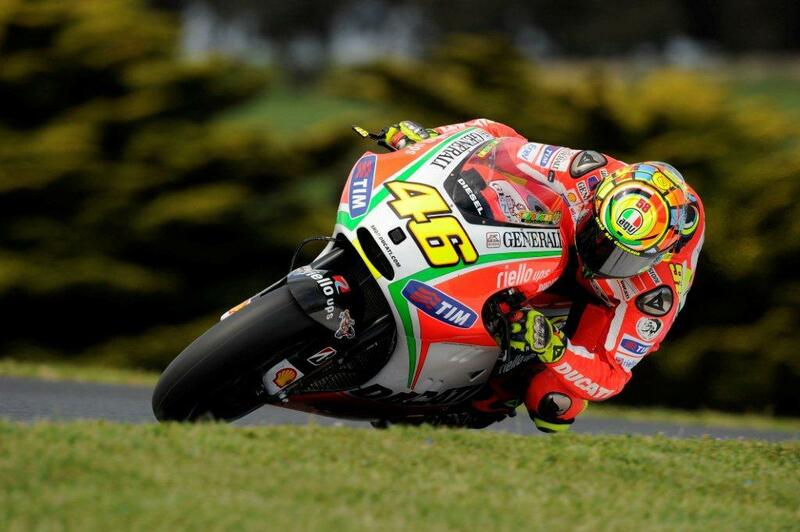 The Italian finished eighth on the timesheets and he told MCN that it was no big surprise to see Stoner in such sparkling form at the Phillip Island track where he remains undefeated since 2007. Rossi said he had no doubt that Stoner could make it six wins in a row at Phillip Island in Sunday’s 27-lap race, despite the injury that has left him with little strength and minimal mobility in his right ankle. Rossi said rear grip in the fast sections of the flowing Phillip Island track was crucial to his own hopes of launching a challenge to Honda pair Alvaro Bautista and Stefan Bradl, who he finished just behind today.